And then, there is the the typical hateful intolerance and hypocrisy from the violent anti-gun zealots, like the University of Cincinnati administrator who recently suggested that, to save the country, people must “Kill the NRA.” What about “celebrities” like former television child stars who send vulgar tweets blaming the NRA when a criminal murders cops with their own guns or aging rock musicians from bands formed nearly 3½ decades ago who claim that they are “definitely more afraid of the NRA than of any Muslim terrorist.” Or the recent group of childish malcontents who don’t rate a mention by name who took to social media hoping to win hearts and minds with vulgar language and obscene images along with their anti-gun rhetoric. 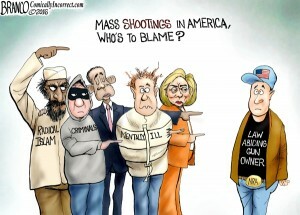 And don’t forget the constant onslaught of “witty” political cartoons which demonize the NRA, such as the winner who depicts the United States Congress worshiping at the alter of the NRA, complete with bloody footprints leading the way – which is ironic considering the blood that must surely cover anti-gunners’ feet when they dance in the blood of the victims after every widely-reported tragedy and the blood on their hands from the gun control measures which have enabled nearly 100% of the mass killings in US history. The narrative pushed by politicians and other assorted idiots is that the National Rifle Association is some big, bad boogeyman – “the powerful gun control lobby that prevents every attempt to enact more gun control laws.” Well… they are half right: the NRA is powerful and the NRA is the main reason why American citizens haven’t been saddled under even more unconstitutional restrictions that we already are. They are also somewhat correct about politicians being beholden to the NRA, although they have a fundamental misunderstanding about how and why. There is even a phrase for this that more accurately describes the situation: doing their jobs! The fact of the matter is that NRA isn’t some group of shady lobbyists in Armani suits in a smoky back room cranking a vise down on politicians’ heads. 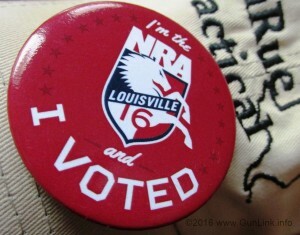 Remember the bumper stickers that read “I am the NRA and I Vote?” Check out the button pictured above from the 2016 NRA Annual Meetings and Exhibits which similarly reads “I’m the NRA and I Voted.” Note that neither one reads “I’m IN the NRA…” Rather, they read “I AM the NRA…” and it’s not a typo. I really am the NRA. So is the rest of the GunLink team and most of our immediate families. Chances are that many, if not most, of you reading this article are the NRA too. In 2013, US News & World Report reported that the NRA boasted 4.25 million members, a number which had grown by 250,000 in the month following the reelection of Barack Obama – including 100,000 new members in 18 days leading up to the start of his second term. Membership officially passed 5 million active members in May of 2013 and, as an NRA recruiter, I can tell you that that number is likely much, much higher now as we have continued to see an unprecedented number of new memberships, renewals and membership upgrades in recent years. Another name for those millions of National Rifle Association members: Constituents. Not just constituents, but constituents who are politically active enough to join a civil rights organization to push back against infringements on a constitutionally protected right – read: voters. To get a better understanding of who calls the shots in the NRA, it helps to have a better understanding of the NRA’s structure. Wayne LaPierre and Chris Cox aren’t huddled together somewhere in a secret meeting plotting about how to illegally funnel weapons to Mexican cartels or bring violent radicals into the country (tasks which are, ironically and sickeningly, typically left to the same people who push for gun control). The NRA is governed by a board of 76 elected directors, one who serves as a “cross-over director” and 75 who serve three-year terms (elected 25 at a time each year). To get on the ballot, an individual must receive 250 valid signatures from verified NRA voting members (i.e. members with five years of continuous membership or Life Members and higher). 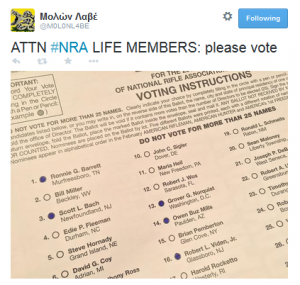 So, first, NRA members select who is on the ballot for the 25 open seats each year. After the ballots are finalized, voting members choose between one and 25 candidates that they think will best represent their views to fill those 25 open seats. So, next, NRA members select who steers NRA’s positions and policies by representing their beliefs. Finally, for the top spots in the Association, the directors (elected by the membership) choose a president, one or more vice presidents, an executive vice president, a secretary, and treasurer from among their fellows, as well as the executive director of the NRA General Operations and the executive director of the NRA Institute for Legislative Action (NRA-ILA). So, in the words of the vapid supporters of more of the same laws that bring us roughly 3,000 people shot and 500+ homicides per year in a single city (a city with some of the toughest gun laws in the nation): “Why won’t the politicians stand up to the NRA?” The answer isn’t because the politicians are afraid of sleazy, well-dressed goons in back rooms and it isn’t because their pockets are getting lined. The answer is that the politicians recognize that the NRA represents the views of 5 million politically involved Americans who strongly oppose gun control as well as the views of many more millions of other voting Americans who oppose gun control but happen to not be NRA members. What do politicians crave? Power. How do they get power? By being in office. How do they get out of office? By alienating huge voting blocks through neglect of their duty to represent the will of the people (or by not cheating hard enough, in some cases). That is how government is supposed to work. A small group of men and women are elected to represent their constituents’ desires at the state, local, and federal levels. Does that ring any bells from back when politicians used to at least pretend to do so? The reason that the NRA is generally so successful at fighting back the constant onslaught of proposed gun control legislation is precisely because politicians recognize that the association is made up of real, live Americans who strongly believe in something and are willing to do something about it (such as writing letters, making donations, and, most importantly, voting). They know that this is not some faux grassroots movement like the astroturf anti-gun groups who are willing to take as much action as someone else’s money will pay for (as long as it doesn’t take too much time out of their jobless days for a mid-day rally and, even then, must use deception to make it look like anyone cares). When they complain about politicians kowtowing to the NRA, they don’t mean that the elected representatives are acting under duress. What they mean is that the lawmakers are a) keeping their oath, b) acting on what they know to be the wishes of their constituents whom they serve, and c) adhering to the United States Constitution and its amendments by which they are constrained.